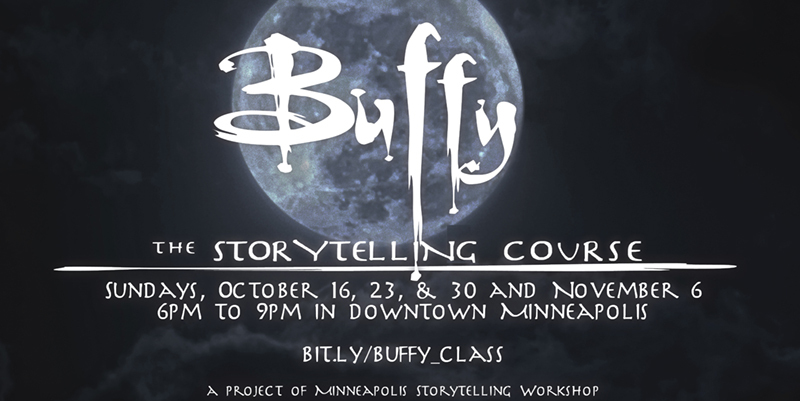 Minneapolis Storytelling Workshop provides interactive workshops on TV, film, games, comics, and even a little bit of literature--anything that uses narrative to change your view of the world. We just love a good story. And good story always starts with good writing. REGISTRATION FOR THIS CLASS HAS ENDED. Please email storyminneapolis@gmail.com to be added to the wait list. Love it. Loathe it. Learn from it. Today's television is putting out a million different versions of feminism and "feminism." Which version do you accept? Which do you want to emulate? What future do you want to create? Join us in this three-session workshop for writers, storytellers, deep-thinking television watchers, and creative folks of all genders. Let's talk about the shows you love and the shows you love to hate. Expect lively discussion, writing prompts, and a refreshing absence of mansplaining. This class is for any writer who wants to enhance their storytelling ability. It's also an appropriate course for folks who love both feminist and "feminist" television and want to explore it in a more meaningful and inspirational way. Mondays, Oct 22 & 29 and Nov 5, 6-9pm. Common Roots Café, 2558 Lyndale Ave S. Registration required. Class fee is $200. THE FOLLOWING CLASS HAS ENDED. Maybe you're terrified of the apocalypse or maybe you find it strangely comforting. But if you love TV and movies set in the end times, this course is for you. Drawing from sources such as Black Mirror, Mad Max: Fury Road, and The Walking Dead, we'll examine the appeal and the terror of this popular trope. We'll also develop tools for world-building, managing backstory, and setting the stakes in your own stories. Over two 3-hour sessions, your two instructors will show clips, facilitate sophisticated discussion, and provide you with innovative writing prompts to deepen your understanding of apocalyptic storytelling. You'll also have the opportunity to share work generated by the prompts in a supportive environment. Unless the world ends first. You love Buffy. You dream about Firefly. And you want to understand how Joss Whedon has cast such a spell. Hundreds of scholarly books and articles have been written about the Buffyverse and other Whedon franchises. It's time for us to sit down, peel back the scaly demon skin on Whedon's work, and find how it has made such a social, linguistic, and literary impact on the world, far beyond its genre or niche audience. Each class will include in-depth conversation of one aspect of Whedon's writing (focusing primarily on the Buffyverse but drawing also on Firefly and Dollhouse as appropriate), including character complexity, subversion of traditional mythology, universe building, and the sweet, sweet pain of withholding satisfaction. Over four 3-hour sessions, your two instructors will show clips, facilitate a sophisticated discussion of the topic, and will provide you with innovative writing prompts to help you begin to understand narrative -- the Whedon way. You'll also have the opportunity to share work generated by the prompts in a supportive environment (kind of like Spike's cozy crypt). Minneapolis Storytelling Workshop is a project of professional writers Allison Wyss and Erin Kate Ryan. All rights reserved.